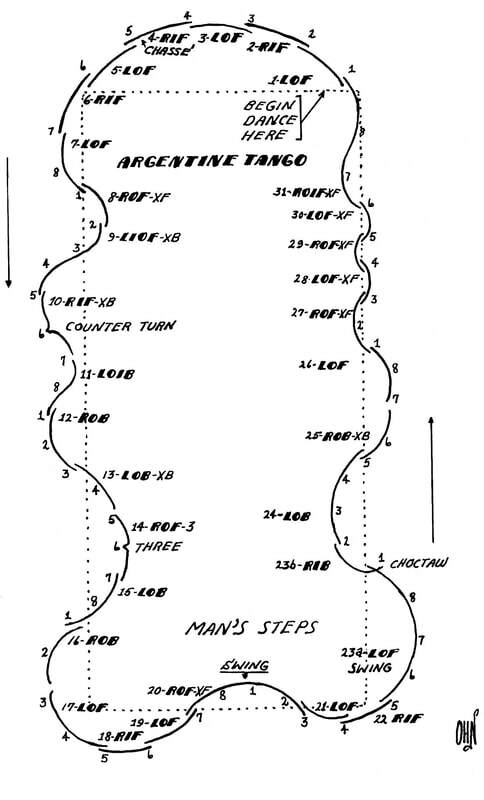 The Argentine Tango is a sinuous dance and should be skated with strong edges and considerable Šlan. Good flow and fast travel over the ice are essential and must be achieved without obvious effort or pushing. The dance begins with the partners in open position for Steps 1 to 10. 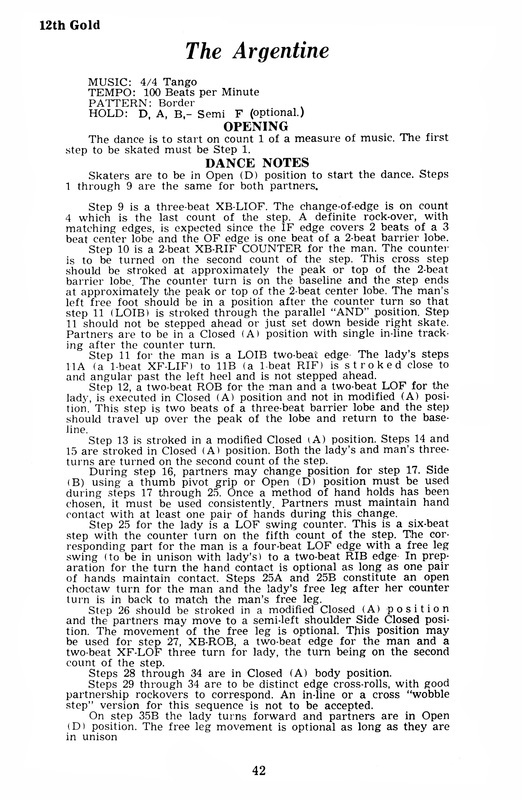 The initial progressive, chassŠ and progressive sequences of Steps 1 to 6 bring the partners on Step 7 to a bold LFO edge facing down the ice surface. 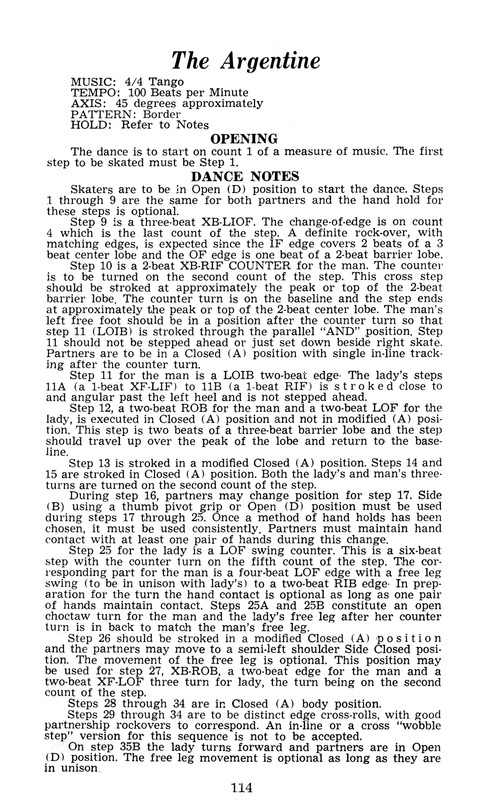 On Step 8 the right feet of both partners are crossed over their left feet; Step 8 is only one beat long; it should not be longer. Step 9 is a long change of edge that starts with a cross behind and proceeds to a change of edge on count three as the free feet swing back past the skating feet to be in position to start the next step (also crossed behind). On Step 10 the man turns a counter while the lady executes another crossed change of edge. 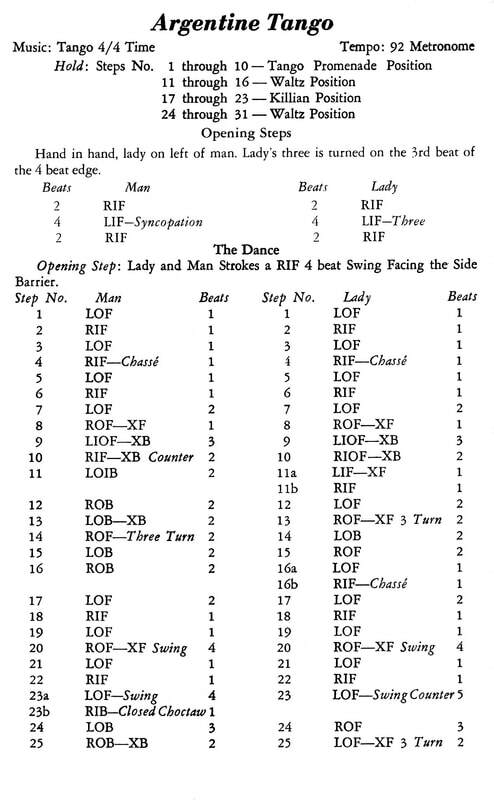 This results in the partners being in closed position as the lady directs her edge toward the man as he turns his counter, finishing his turn in closed position. Step 11 is deeply curved towards the side of the ice surface. 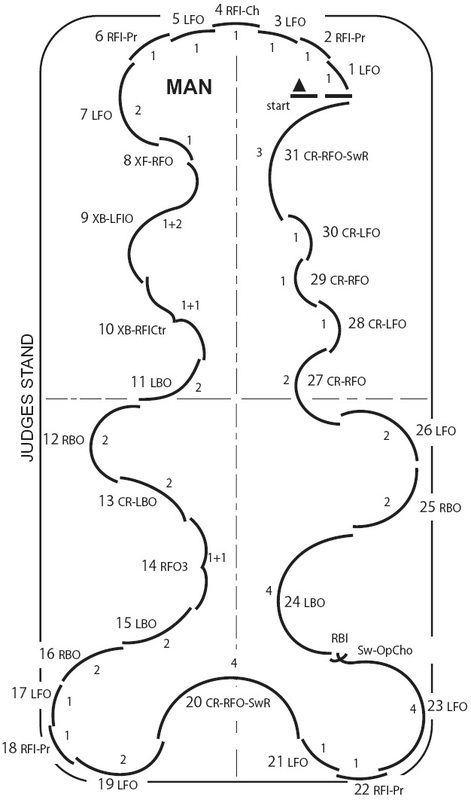 At the end of this step the lady momentarily steps onto a right forward inside edge before skating Step 12 which is deeply curved toward the longitudinal axis. 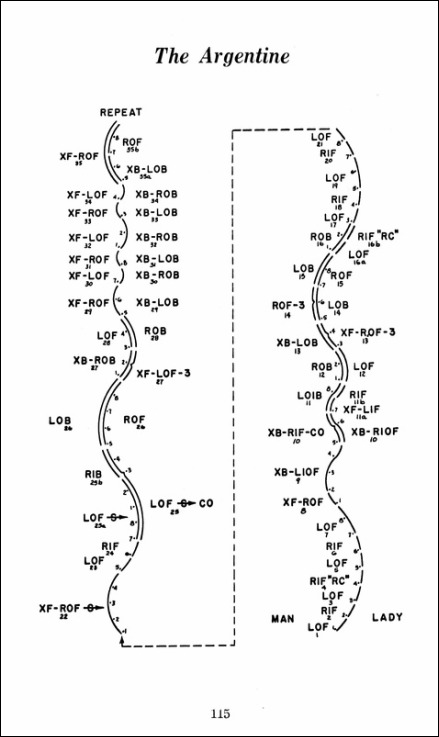 The lobe formed by Steps 13 to 15 starts with a cross roll towards the longitudinal axis. The lady then turns a three toward the man; the man responds with a three turn toward the lady in rapid succession. These are deep edges which direct the lobe again towards the side of the ice surface. The man skates a two-beat edge while the lady skates a chassŠ. He then steps forward to place the couple in Kilian position. 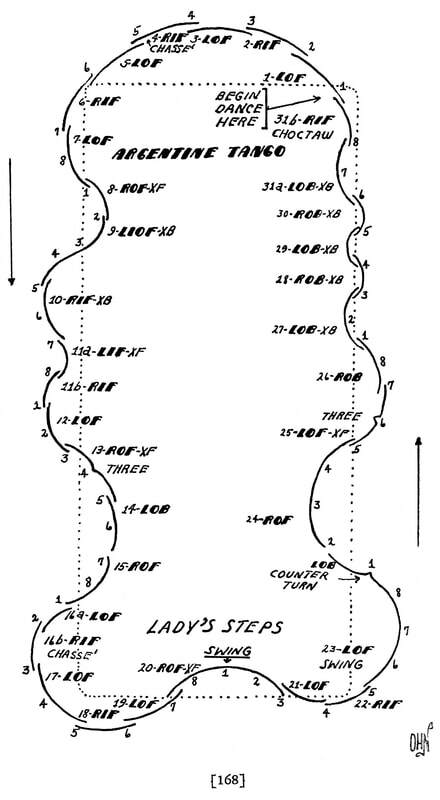 Steps 17 to 19 form a progressive sequence followed by a cross swing roll (Step 20) across the end. Another progressive sequence leads to Step 23. This step is a forward twizzle of one rotation for the lady and a swing open choctaw for the man turned between count four and count one of the next measure. During the twizzle the lady has her weight on the left foot but carries the right foot close beside it. 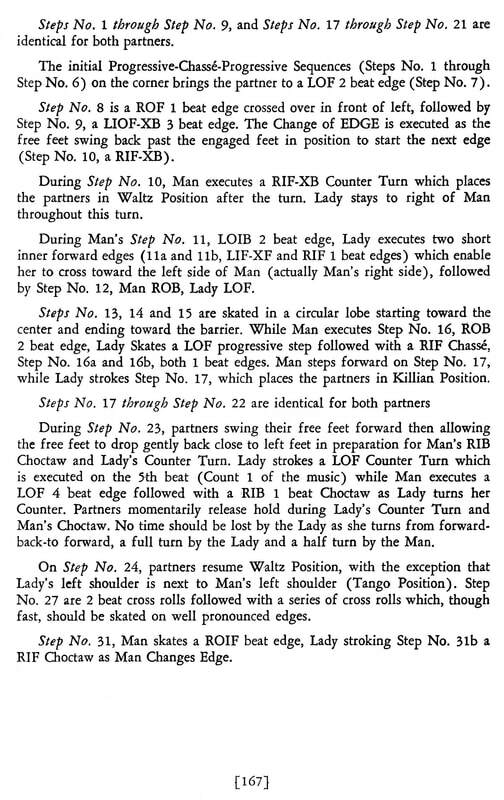 Execution of Steps 21 to 23 requires the lady to skate hip to hip with the man, her tracing following his. The shoulders of both partners must be strongly rotated. After this move is completed, the couple moves into closed position. 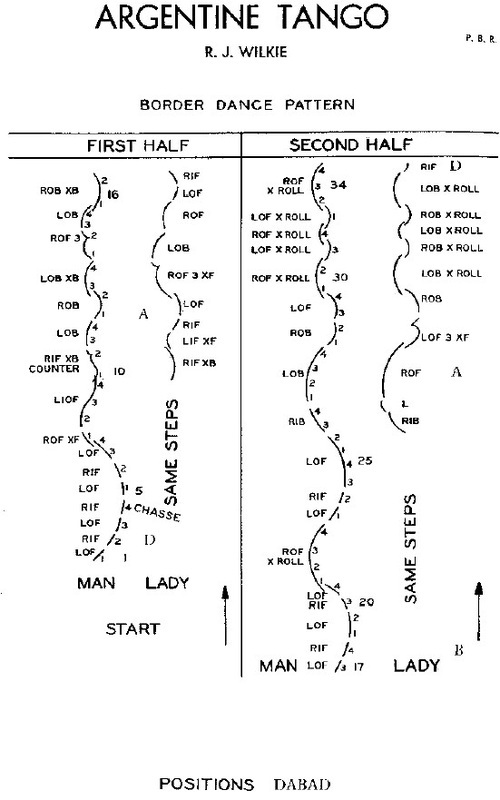 Step 25 is a cross roll for the lady but an open stroke for the man. As the lady aims her three at the man, he steps forward into outside position with the lady on his right. 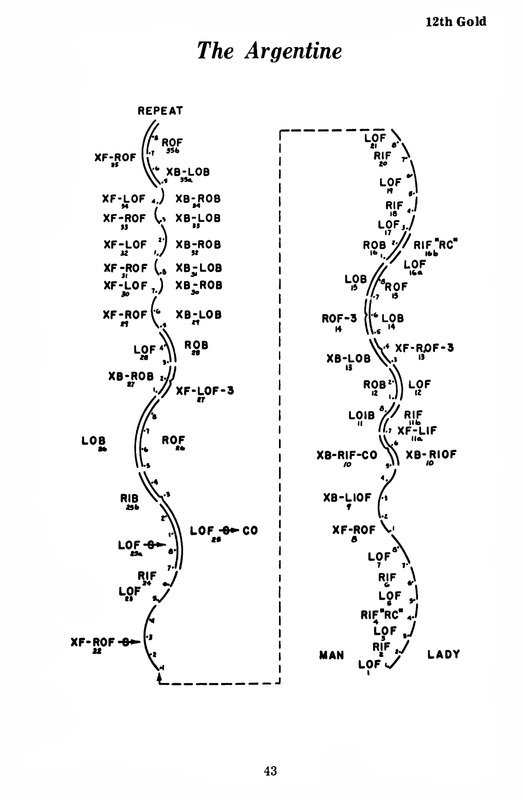 Steps 27 to 31 are a series of five cross rolls directed down the ice surface. The first cross roll is held for two beats, while the next three are one beat each. The partners should skate the cross rolls lightly on well curved edges. 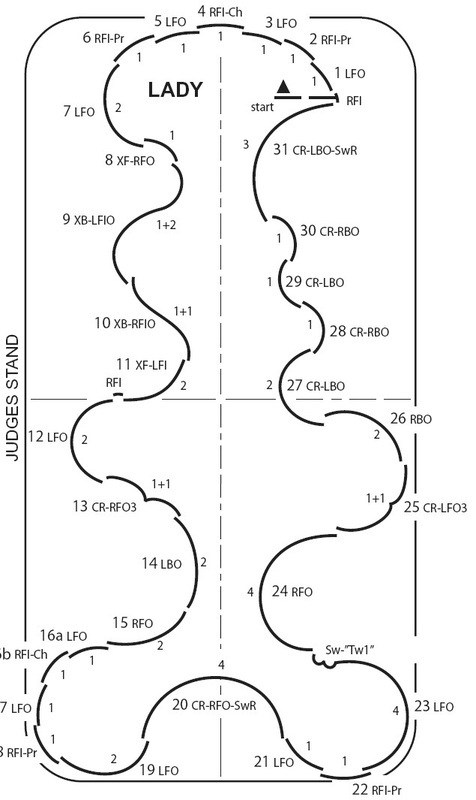 The final step is a cross-rolled change of edge; at its conclusion the lady steps briefly onto a right forward inside edge between counts four and one which enables her to turn forward for the repeat of the dance. This tango is danced to the rhythm of Latin American tango music where the musical count is 1-2-3-4-and-1, etc. This differs from the Spanish tango rhythm of 1-2-and-3-4-1, etc. The many varied step sequences in this dance are complementary to the dramatic and romantic character of the music. Dancers must at all times be aware of the rhythmic timing and reflect this in the execution of steps and in expressive interpretation of the music. Prolonged free leg extension, upright, graceful carriage and good unison are needed for this dance. Where appropriate, rotations must be fast but controlled. The partners should make maximum use of the interpretive elements of the dance, including the short steps, quick turns and serpentine movements. No notes provided in the publication.